Manage the flow of radioisotopes with real-time decay in a multi-user and multi-facility environment. Manage low-level radio isotope licenses, decay, storage, use and disposal. Track radioisotopes with real-time decay. Manage a site's Material License with isotopes and limits. Generate Isotope-specific storage and use reports. Manage isotope inventory with automated decay. Manage isotope use at the lab and project level. Manage isotope waste with automated decay. Compliance with strict isotope license rules and limits is critical to a facility’s operations. Monitoring where, how, how much and by whom radioisotopes are used provides real-time information that can be reviewed instantly so that necessary adjustments can be made. Through easy to use menus and options, our Radioisotope Tracking System (RTS) monitors facility licenses, isotope limits, location limits, radioisotope use authorization, decay, disposal, and reporting. Our RTS addresses all the unique issues associated with the acquisition, approval, storage, use, decay, monitoring, disposal and regulatory reporting of radioisotopes. 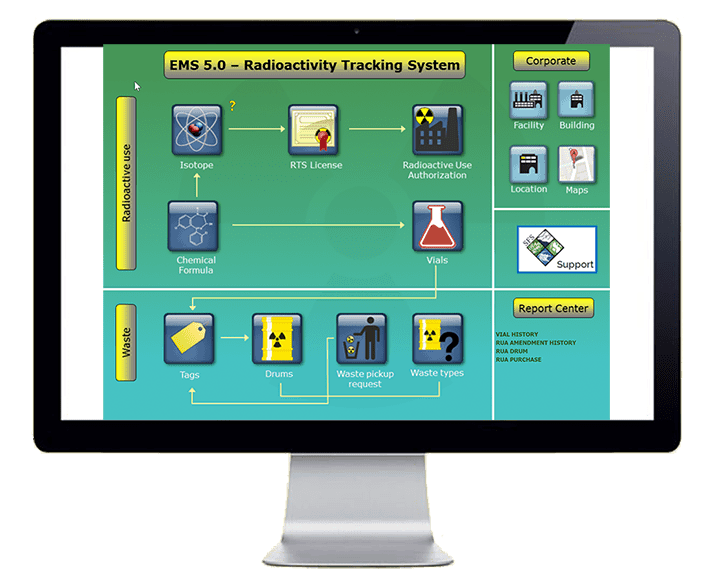 Chemical Safety’s Radioisotope Tracking Software System is designed to help manage the flow of radioisotopes in a multi-user and multi-facility environment. Good safety practices as well as strict federal regulations require that radioisotope use be managed from the facility license down to an isotope’s smallest denomination. By dynamically decaying isotopes in real-time, the Radiation Safety Officer has a real-time view of individual isotope activity at each facility, location, Radioactive Use Authorizations (RUAs) and individual experiments. The system automatically alerts the RSO and Environmental Health and Safety staff via email when an event occurs that has or may cause an issue of compliance or safety. The RTS is easy and intuitive to use and operate through smart menus and actions, it reduces the time required to keep information up-to-date, simplifies the movement, monitoring, and disposal and ensures compliance with facility and isotope license limits. The EMS waste management module has tools that simplify the recording, disposal and reporting of radioactive mixed waste. EMS has simple and intuitive tools that allow authorized personnel to record mixed waste activity that is being disposed. EMS has built in radioisotope decay calculations, so whether in inventory or being disposed, radioisotope activity can be calculated with accuracy and precision, which supports compliance monitoring. The EMS task management system allows you to create and manage projects including cost, personnel, department, and due dates. As well as each task necessary to complete any project. The task management system also assists in monitoring the data for conditions that could indicate a problem or require attention. For example the EMS can be configured to alert you when waste containers are approaching their limit, unauthorized purchases have been made, or regulatory deadlines. The EPA Regional Labs at Research Triangle Park North Carolina has been using Chemical Safety's EMS Radio Isotope Tracking (RTS) Software to manage the acquisition and disposal of low-level isotopes. A leading government institution located in Research Triangle Park, North Carolina needed software that would manage the acquisition, storage, use and disposal of low-level radioisotopes. Isotopes were purchased centrally under the facility’s radioactive license, and used in various RUA experiments without set project oversight and monitoring. Isotope decay was not calculated, and this resulted in uncertainty as to the proper use of isotopes. Disposal of used or spent isotopes was also not managed efficiently. Chemical Safety Software was tasked with implementing the EMS-RTS software solution that addressed these issues efficiently, maintaining current and accurate isotope inventories, setting RUA project limits, utilizing barcode labels and smartphones and tablets to easily update information and monitoring compliance with isotope license limits. Chemical Safety configured EMS on a cloud-server, transferred location, isotope vial and waste container data from disparate data sources into a single database, cross-referenced the isotopes with license limits and trained lab and research personnel on ways to update information using smartphones and tablets quickly and easily. The solution provided by Chemical Safety was the implementation of processes centered around our comprehensive RTS management software. With EMS-RTS, Radiation Safety Officers were able to set, monitor and manage user authorization and isotope limits per RUA or project. RTS Tags are used to track and group the waste vials and decay them automatically during storage. Tags constitute the intermediate step before the waste handler starts the pickup operations. The solution was well received by all involved within the organization. Regular reporting has validated the accuracy and effectiveness of the EMS-RTS software solution.